Split is the latest film from M. Night Shyamalan, of course he needs no introduction as everyone has heard of at least The Sixth Sense. Personally I would put his super hero flick Unbreakable as one of my top 30 films of all time, yet as the years went by he began to seem like a one trick pony, cursed with the expectation that there would be a huge twist at the end of whatever film of his you were watching. For me I had lost faith, none of his films after the first couple were memorable to me, the twists became obvious (The Village, The Visit) and despite always choosing the perfect actors the films just had lost the zing that I had come to expect. 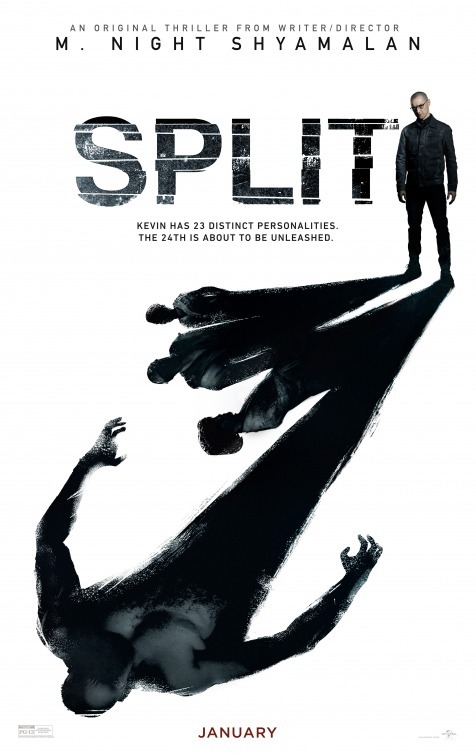 As such going in to see Split my expectations were pretty low. Three teenage girls including loner Casey (Anya Taylor-Joy from Morgan and The VVitch) are just about to head home from a party when they get abducted by a serious looking man (James McAvoy) . They awaken in a make-shift prison cell and soon discover that their captor has dissociative identity disorder, the most dominant personalities being the stern OCD inflicted Dennis, matriarchal Patricia, and a nine year old called Hedwig. Learning that someone dangerous referred to as 'the beast' is going to come for girls they must try and find a way to escape their confinement. The most annoying thing about watching a Shyamalan film is that you can't help but constantly be thinking what the inevitable twist ending is going to be, for me this was never far from my thoughts, and that did get in the way of my immersion at some points. I was glad to see however that when the twist does occur I was blown away, it was not something I had thought of at all even if it does slightly ruin the tone of the film for me. This is a thriller at it's heart with some horror moments thrown in for good measure, for me though the kidnapping of the three girls wasn't what interested, it was more the exploration of just who McAvoy's character is. It becomes apparent early on that the girls really are not that interesting in terms off what actually happens with them in the movie. Taylor-Joy has some complex shades to her personality, I loved the way flash backs from her childhood are slowly drip fed to give you an idea just what has shaped her to be the way she is. These flash backs were unsettling at times, the child actress who plays this young Casey (Izzie Coffey) did a good job for someone so young. The other two girls are never given a chance to show much personality at all, they also on the whole get very little screen time, with the majority of the near two hour film centring around the many people their captor is. When I heard that there were 23 different split personalities I thought it would border on the ridiculous, wisely we only see a handful of this vast group. McAvoy has his own way of acting when he is each one and it was pleasing to see an obvious difference in the way he changed between them, by the end of the film it is obvious who is 'in control' just by the facial expressions McAvoy pulls. There are some moments of brevity, mostly with the boy Hedwig we get to see the film at it's most silly, one scene in which he does a dance to a Kanye West song was pretty hilarious. In general the naive way he acts when being this persona delighted. I was pretty impressed overall with his performance, without him Split would have been nowhere near as good. The problems for me first come with the lack of any real feeling of peril for the plight of the three girls, Split almost goes out of it's way to make the viewer know they are not in too much trouble, I never got a sense of danger from McAvoy's character on the most part and when I did it was by the use of strange conventions that I felt detracted from the believability of events leading up to it. There is not much horror here, but there is plenty of mystery. The sub plot involving his psychiatrist Dr. Karen Fletcher (Betty Buckley) was pretty interesting, I liked Buckley's performance, and it was good to see the man interact with someone on an equal footing rather than as a captor. Aside from a few missteps such as a chunk of the finale that was a bit silly there wasn't much to fault here, Shyamalan directs this wonderfully with some well shot scenes, and editing that wasn't as manic as I thought it would be. Getting Mike Gioulakis to be the director of photography was a genius move as he is one of the reasons It Follows looked as good as it did. 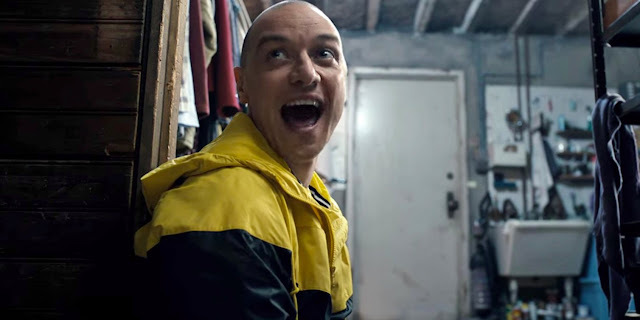 Split was a surprising return to form for Shyamalan, it was on the whole pretty good, it constantly surpassed my low expectations. While Taylor-Joy is the only memorable character out of the three girls it is McAvoy who impresses most, doing wonders with a challenging role. It may be a bit of an albatross around M. Night's neck having to have a twist ending for every film he does, but for me it actually breathed some new life into the film, so much so that I shall be going to see it for a second time which is a rare thing for me.